The operative microscope has significantly advanced modern neurosurgical brain tumor surgery but continues to be limited by high costs, suboptimal optics, poor ergonomics, and difficulties with maneuverability. 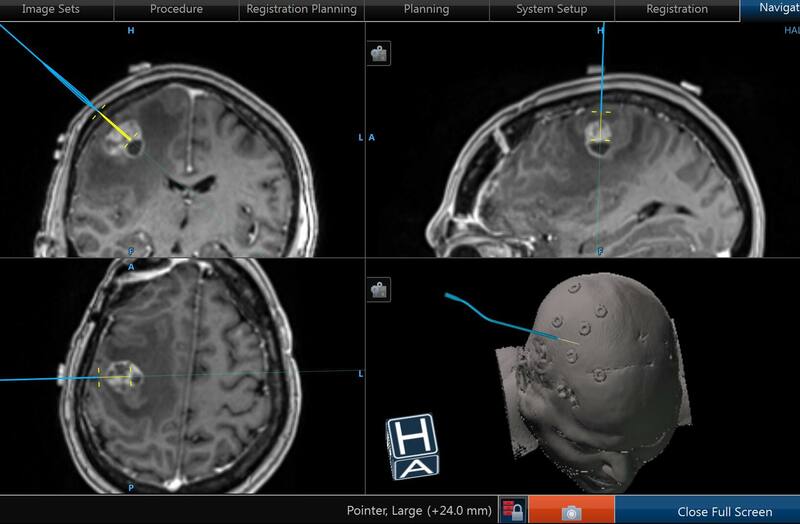 We believe the novel 4K-HD 3D exoscope (EX), may improve brain tumor surgery by augmenting the surgical corridor through advancements in illumination, ergonomics, magnification, and depth of field and has the potential to be utilized in neurosurgical education and training. As shown in the above video of a surgery in a woman with a brain metastasis, the low profile EX allows for excellent operative corridors and instrument maneuverability during brain tumor surgery. The large monitor also results in an immersive surgical experience, and gives team members the same 3-dimensional vision as the operator. This novel 3-D 4K-HD EX system possesses improved optics, ergonomics, and maneuverability, with the EX's shared surgical view having obvious educational and workflow advantages. Further clinical research is needed to examine the clinical effectiveness of the EX system for different surgical approaches through quantitative methodology.